The crushing suspense of "Das Boot"
Wolfgang Petersen's "Das Boot" is a tense psychological drama with a powerful anti-war message and enough nerve-wracking suspense to make your heart pound against your chest like depth charges rupturing a submarine's hull. 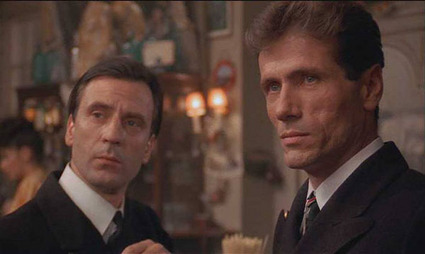 But before I get into why "Das Boot" is possibly the most authentic war film ever made, I'll try to clarify which version to go for as each is almost completely different from the other. The original theatrical version that came out in 1982 is a trimmed down version of a six-hour mini-series that aired on German television the year before. This heavily edited version is the worst version available and yet it earned the film six Academy Award nominations. Watching the 145-minute original theatrical version is the equivalent of watching game highlights when you miss a 90-minute sports match. You get all the action sequences but don't see what leads to them, which is a shame because "Das Boot" is about the journey leading up to the destination. It was never meant to be seen as an all-out action flick but rather a long epic voyage into torturous warfare. So in short, avoid the original theatrical release at all costs. 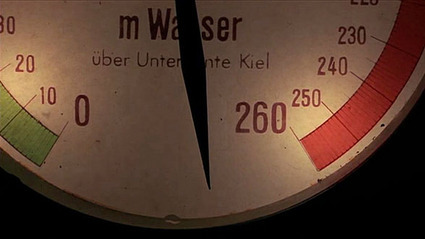 In 1997, Peterson revisited the film and released a Director's Cut clocking in at 3 hours and 20 minutes. The Director's Cut also features improved sound and better picture quality. The additional footage before and after the key battle scenes perks up the previous release with more fully realized character development. This version is far superior to the original theatrical version and the result is nothing short of a great film. I recommend the Director's Cut to viewers who are yet to embark on this brilliant drive. Depending on whether you like it or not, I would go for the ultimate and last version of the film. With the introduction of DVD technology, Peterson quickly released the film "as it was originally intended to be seen." The original uncut version runs at 4 hours and 42 minutes in length and is the most complete version available yet. Peterson basically cut out the opening and closing credits of the TV series and stitched all the footage together into a humongous continuous feature film. Peterson once said that "the fully restored mini-series will be even more shocking and affecting for audiences" and while it does enriches the experience to a whole new level, it is not for everyone. 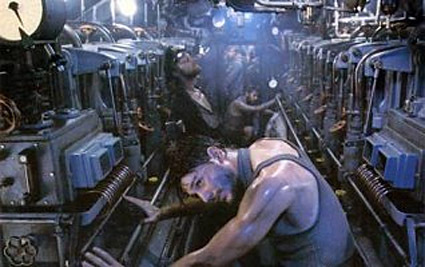 The uncut "Das Boot" adds more waiting and forces the viewer to endure the daily trauma and monotony of the crew members. We get more background information about the characters and get to know them better through their conversations and boredom spent in silence as they eagerly await orders for anything to happen at all. I prefer this fully restored uncut version because it makes the mounting tension and sudden plunge into terrifying action all the more surprising and shocking. I also like the added narration as it makes the experience more personal. Wolfgang Peterson doesn't go into any politics or waste time with the horrors of Nazi ideologies. We've been bombarded with films taking this angle many times and had he used the available material to portray a bunch of villains taking orders from an evil leader we wouldn't be discussing the film 30 years later. He was wise in taking the risk to avoid such an approach and even wiser for not resorting to Nazi propaganda for "Das Boot" is simply a detailed account of single patrol mission and nothing more. 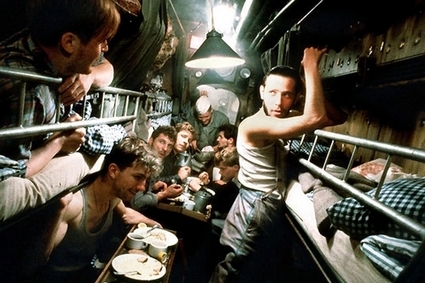 The viewer has no choice and there's no room for judgments as Peterson effectively places us amongst the cramped hulls so that the viewer is more of a crew member than an outside observer. According to IMDB, "the producer greeted the first American showing of the film at the Los Angeles Film Festival with great trepidation. They weren't sure how a former enemy nation in that war would react to the film, especially in a city with a large Jewish population, and their fears were reinforced when the audience applauded the opening caption saying 30,000 of 40,000 German submariners were lost in the war. However, when the film ended, the audience gave the film a standing ovation in appreciation of the artistry of the filmmakers." Cinematographer Jost Vacano shot the film by maneuvering within tight quarters using a handheld camera. It amazes me that he maintained steady shots when dealing with actors rushing in and out of a frequently shaking cramped confinement. 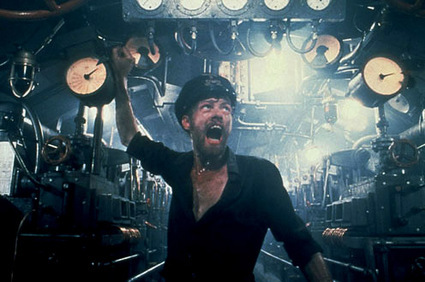 It is through his unconventional approach of filming such material that we learn how a submarine works. Handling a submarine relies on teamwork more than anything and Cacano makes sure we don't miss any of the collective labor efforts. When destroyers start dropping depth charges on the grey wolves that submerge in a desperate attempt for survival, some are attempting to prevent spraying water from adding weight to the iron ship, others attend to the wounded and the captain through constant damage reports guides them with specific orders towards a hopeful escape of death. Following emergency dives, the unit gathers in the control room patiently playing the wait game. Exhausted pale eyes face the depth gauge with both hope and fear. Scenes of this kind will keep you on the edge of your seat. Through the superb use of sound the tension keeps mounting resulting in moments as intense as the Russian roulette scenes in "The Deer Hunter." Sonar pings echo within the iron coffin. As they are forced to take the submarine deeper pushing the boundaries of its capabilities; we hear the lingering sound of steel crushing under severe water pressure. 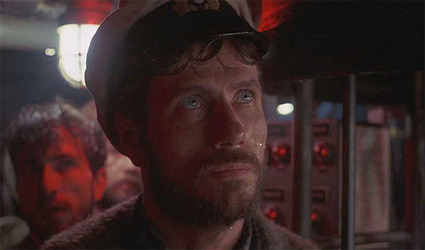 The utilization of sound in "Das Boot" should be studied in film classes as an example of the importance of cinematic audio. 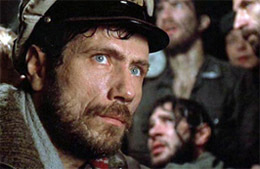 Through both sight and sound, "Das Boot" manages to put the viewer closer to the realities of war than ever before. Every great war film excels in its field in a different way. 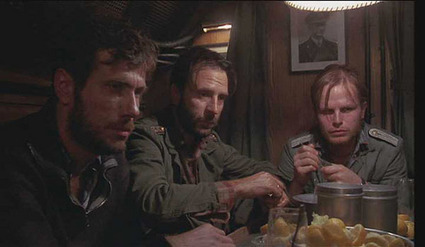 "Apocalypse Now" does it through philosophy, "The Deer Hunter" through intimacy, and "Das Boot" stands out for making the viewer experience naval warfare. It can't be explained any other way; I gasped for air when the submarine surfaced, I held my breath when the sound of propellers marked the presence of a faceless threat above, and I was relieved after the crew barely survived sudden attacks. By the end of the film we feel like we have literally gone through war. 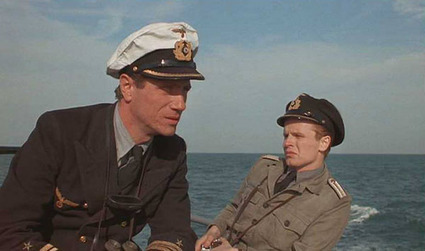 At the beginning of the film a supposedly legendary u-boat captain by the name of Thomsen remarks that the young enlisted recruits have the "belief in our Fuhrer in their eyes" and then verbally delivers the essence of the movie "they will know in time." Like many others, when I first watched "Das Boot" I thought looking at the war through Nazi eyes would be a waste of my time. When the credits rolled at the end, the words of Thomsen ringed louder, for like the now long bearded recruits, I knew. I knew that no war is worth the psychological torment. I knew the painful suffering that lead tens of thousands to their deaths. I knew the truth about life on a submarine. And I knew why Wolfgang Peterson worked two years to film such heavy material. Do yourself a favor watch the four hour version and in time you'll know too.